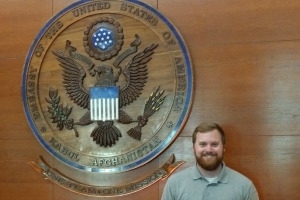 Stu Henderson, MSA ’16, never thought an accounting degree could get him a job in Afghanistan. But with Kogod’s help, Henderson was able to pursue his passion for forensic accounting abroad. Professor Evans’ and Professor Lindsay’s classes were especially helpful preparing him for his current career. Henderson is currently working in Kabul as an Investigative Analyst for the Special Inspector General for Afghanistan Reconstruction. Read more about his experience below. Kogod School of Business: How did you find the job in Kabul? Stu Henderson: During my last year at AU, I interned for the Special Inspector General for Afghanistan Reconstruction, an internship I wouldn’t have gotten if it weren’t for my previous federal internships. I worked with an amazing group of people in D.C. and jumped on the opportunity when they offered me a position in Kabul. KSB: What work do you do at your job in Kabul? SH: I work with the most hard-working group of people I know, and love every minute of it. My team investigates fraud, waste, and abuse of U.S. government projects in Afghanistan. While we’re not designing and implementing programs, our job is important because we ensure our projects benefit the general Afghan public, rather than a few corrupt individuals. I wasn’t able to study abroad while at AU, so I feel like this is my study abroad trip. It definitely has a college feel because you’re stuck in a compound with the same group of people every day ---except here we get to ride in helicopters! KSB: What internships did you have in the past? SH: My first internship was with the Department of Defense, in their Office of General Counsel. It wasn’t forensic accounting or law enforcement like I was hoping for, but it was a great experience. Prior to the internship, I wasn’t sure if I wanted to work in the private sector or for the government. After being part of such a huge organization and seeing what a big impact my work could have, I knew I wanted to stick to the government. Next up was a Department of the Treasury office, and after that the Financial Crimes Enforcement Network (FinCEN), also a section of the Treasury. I know I definitely wouldn’t be where I am today if it weren’t for the incredible experience I gained at FinCEN. I knew my work there would be valued and make a difference. I contributed on a case that resulted in a $200,000 civil money penalty against a financial institution, hopefully the first of many law enforcement actions I contribute to. KSB: What Kogod resources have helped you throughout your career? SH: Kogod’s Center for Career Development gave me some great advice on how to craft my resume. Lots of people in D.C. have internships, so it’s not enough just to list what organizations you’ve worked for. You really need to showcase your experience, and KCCD really helped me do that. My resume was covered in red marks at the end of my first visit! KSB: If you could give a piece of advice to current and future Kogod students, what would it be? SH: A new student shouldn’t worry about what their experience might look like to others. My first year of college, I volunteered at a military not-for-profit. Other people may have had an experience they thought was more prestigious than mine, but I enjoyed the work and the mission. When I started at my DoD internship, my supervisor told me they chose me because I stood out from other applicants due to my military-related volunteer work. I think it’s much better to take a position that interests you, rather than what might look better to someone at first glance. Learn more about Kogod's Master of Science in Accounting program here.